This past weekend I celebrated my birthday. Honestly, I didn’t make plans and figured I would just go have a drink at one of my favorite local bars here in Knoxville, maybe catch a movie and generally be low key about it. The older I get, the less important celebrating my birthday is to me. I mean, who wants to grow old? If I wasn’t for my amzing drop dead gorgeous girlfriend, I probably would just stayed at home, cleaned my house and organized my beer cellar. BOR-RING! Luckily I have DO have an amazing, drop dead gorgeous, craft beer loving, travel companion of a girlfriend. Staying at home and not celebrating wasn’t an option. She told me that I only turn (insert random number here) once and she was determined to help me make the most of it and drink some beer! She gave me a great birthday gift by booking us a short get away to our favorite BEER CITY, Asheville. Beer City USA, 90 minutes that way! The plan was to leave Saturday after seeing some friends at the kick off of Knoxville’s Market Square Farmer’s Market. For various reasons, we didn’t leave town until after lunch. That was totally fine with me since I was able to have nachos and a White Mule pale ale at The Downtown Grill and Brewery before hitting the road. We arrived to a rainy Asheville. After checking in to the hotel we always stay at, Downtown Inn and Suites, it was time for some bottle shopping! The first (and my favorite) bottle shop we stopped at was Bruisin’ Ales. As soon as I knew we were going to Asheville, I reworked my budget so I could buy rarities not available at home to replenish my cellar. Shopping at Bruisin’ is great. Not only is it owned by 2 of the coolest people in Beer City, Julie and Jason Atallah, but they also have great selections to try with their sip and shop. You also never know who you are going to run into there. As was the case when this time when I ran into local emcee/street poet/ artist by the name of Chachillie. We spoke for a little while and he ran an idea for a music video by me. He also kicked a freestyle rhyme out on the sidewalk in front of the store. I saw Julie on her way out and got a birthday hug. After going over our options Katie and I made our purchases and decided to head up the road to our next stop, Appalachian Vintner. App Vintner as it’s known also boast an amazing selection of beer, wine and other libations. Located in the outskirts of what’s considered the Biltmore Village area, they have a bar with an expanded tap selection. They go out of their way to have rare and tasty beers on tap. I purchased a half pour of a 2011 vintage Uinta Labyrinth. My primary loyalty will always be to Bruisin‘ but the great thing about having multiple bottle shops in town is that there is always something different. Some shops sell out of certain brands and varieties sooner than others. Katie and I spent even more money and I was able to pick up a few things to share with my friends. I also got a gift for my buddy Richard Groves so he can have something special for his 1000th Untappd check in. Well with 2 bottles shops down, we thought that we might as well hit one more just to see what else we could find. Hops and Vines is a homebrew store with a limited bottle selection. Since it’s primarily known as a place to buy brewing supplies, they sometimes have a few rare craft beer bottles that are sold out elsewhere else. I picked up a 6 year vertical of Sierra Nevada’s BigFoot Barley wine at a decent price and 1 or 2 other things. At this point it was getting late and we still hadn’t hit any breweries. It was time to go a few blocks up the road to Altamont Brewing Company. 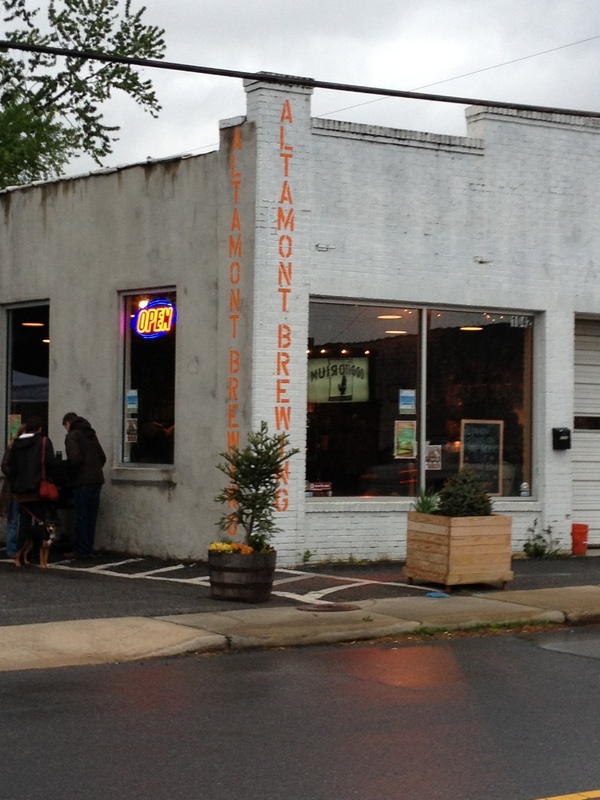 Altamont Brewing on a rainy day in May. The last time Katie and I visited Altamont they had just started brewing. At that time they only had their porter on draft. This time around they’ve been at it for a while and had a great variety. Since we were brewery hopping and planned on hitting as many places as possible, we only stayed for one drink. I had the Hopped Red and Katie had the Amber. Both were delicious and well crafted. We drank our beer while listening to live music and soaking up the local vibe. I really like the neighborhood bar feel of Altamont and will make sure to always fit it into our itinerary. Drinking and winking at Altamont Brewing Company. The next stop of the evening was another must visit when in Asheville, Wedge Brewing Company. Everyone knows I love Wedge’s beers, location and complimentary peanuts. We found a table inside by the bar looking towards the fermenters. We drank half pours of the Hellesbock, Derailed Hemp Seed Ale, Witbier and a Saison of theirs that I hadn’t had before. By the time I ate a whole bowl of free peanuts, I realized a little too late how hungry I was and how I hadn’t eaten since lunch. It was time to leave and head for dinner (and another round of drinks) at Wicked Weed. We arrived at Wicked Weed through the pouring rain. It was a Saturday night, so we knew to expect a wait for a table. We checked in with the hostess and got a pager to tell us when our seats would be ready. Down the stairs we headed to grab a drink. As I walked towards the Downstairs bar I heard “Hey Ratchet!” I turned around and who did I see but Wicked Weed’s head brewer Luke! We spoke for a while and he talked about the brewery’s success, the sour and barrel programs and introduced me to his brother Walt who is in charge of those. All this time I was sipping on their Genesis Blonde Sour. After some great conversation with the Dickinson brothers, Katie and I headed upstairs to have a meal. By this time my stomach wasn’t doing so great. All the beer I had drank throughout the day combined with Wedge’s peanuts was not a good combination. I ordered fries and a beer and could not finish them. This was my fault for not eating anything substantial since earlier in the day. I know better but in the excitement of everything, I had just plain forgot. I alternated between watching my darling nom on one of Wicked Weed‘s epic burgers and going outside to walk off my discomfort in the rain. After leaving Wicked Weed it was time for a nightcap at Thirsty Monk. I still wasn’t feeling up to putting anything else in my belly, so I just went and sat with Katie at the downstairs bar as she sipped a few tasty Belgian style ales. The next morning the weather was still rainy and chilly. It was Cinco De Mayo which Katie is big on, (must be ’cause she’s originally from Texas) so she insisted on tracking down some great Mexican food. First things first, we had to get coffee. Much like I am with beer, I am a coffee connoisseur. I usually only drink fair trade organically grown coffee fertilized with crystalized free range unicorn tears and hand roasted by Norwegian elf spirits. I would rather have a headache from not getting my morning cup-a-joe than drink hotel coffee. Over the years I have had coffee from many places all within a walking radius of the hotel. I’ve been searching for that perfect cup. I finally found it. From now on it’s only French Broad Chocolate Lounge‘s Counter Culture French press coffee for my morning fix. They also have the best selection of pastries, cakes, liquid truffels and other tasty treats to go with it. I got my french press light roast and Katie opted for the Oaxaca Hot Chocolate. I saw they had Highland Mocha Stout cake and couldn’t pass up getting a slice. After coffee and my decadent snack, it was time to get a solid meal. Looking up Mexican fare on our phones, Katie found Limones. It seemed like exactly what she was looking for, so we headed over. I’m really glad we went. The service, decor and food was all top-notch. I didn’t need a big meal having had cake previously. I knew I wanted a cervesa so I could earn my Cinco De Mayo badge on Untapped. I chose Bohemia after looking up reviews for it online. It’s was a very decent Czech style pilsner brewed in Mexico. It was light, refreshing and paired great with my scrambled eggs and home fries. We ate and ended up boxing plenty of food for later. The day was getting on and I had things to do back at home in Knoxville. My friend Vanessa was up from Florida visiting my son and his mom, and I didn’t want to miss her before she left. After a quick stop at Earth Fare to look for more beer, Katie and I hopped back on the interstate for the drive home. Our trip to Asheville this time was short but sweet. 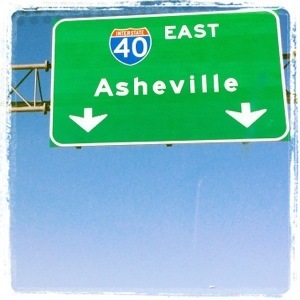 We are already looking forward to our week-long vacation for Asheville Beer Week. There are so many events during that time that we’re still trying to decide which ones to go to. We already have tickets to a few things such as the Asheville Rare and Wild Beer Tasting and Beer City fest. Thanks for reading about my Asheville birthday trip. I highly encourage everyone reading this to get your friends to go online and VOTE. Let them use your tablet, your smart phone, you sister’s mac, your weird brother’s Linux, the library computer or that 56k modem your grandma is still has hooked up to go vote for Asheville to retain the yearly title of Beer City USA. The polls are private this year but Grand Rapids is being very vocal in the comments. Let’s help Asheville win the bragging rights for the 5th year in a row. Once again, Click here to vote. Enjoy my photos below. Click on them to enlarge. I hope this one is better than the last Rogue VooDoo Donut which I found pretty undrinkable. 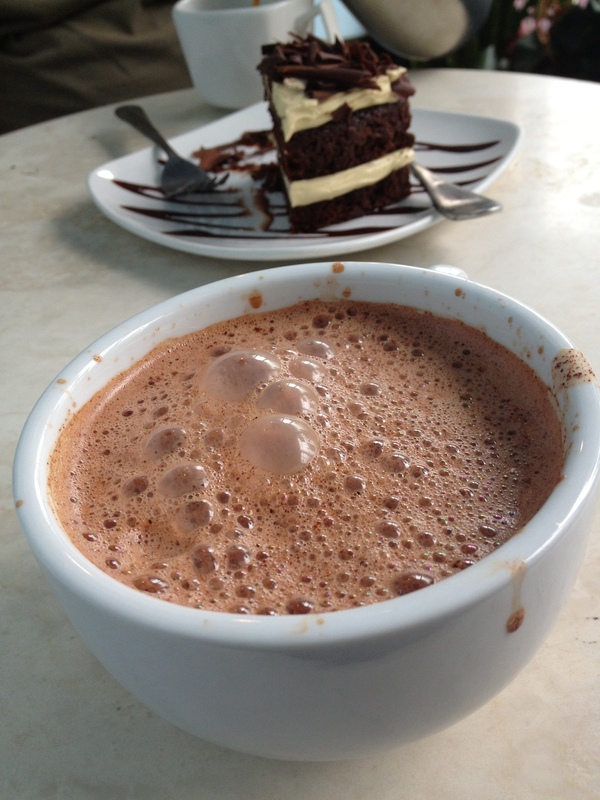 French Broad Chocolate lounge is decadently good! A must visit when in Asheville! Happy Cinco de Mayo! This was a pretty decent pils enjoyed at Limone. A tale of 2 Deviants. One brewed in CO and 1 brewed in Brevard. Which did she buy? Local of course! This entry was posted on Tuesday, May 7th, 2013 at 17:45 and is filed under #AvlBeer, #knoxbeer, #NCbeer, Asheville, Asheville Beer Week, Asheville beercation, Asheville Brewing Company, Beer, Beer City Festival, Beer Festival, beer travel, beercation, Casual Pint, Craft Beer, Drinking, Knox Beer Crew, Knox Beer Week, Knoxville Beer, Knoxville beer blog, Knoxville Beer week, Ratchet. You can follow any responses to this entry through the RSS 2.0 feed. You can leave a response, or trackback from your own site.